An action figure is a doll-like toy designed to resemble characters from movies or literature. The figures can be articulated to hold a variety of poses and may come equipped with accessories, such as clothing, tools, weapons, and vehicles. Action figures are created by assembling molded plastic parts made based on hand-sculpted prototypes. The term action figure was first used in 1964 by the Hasbro Company's Don Levine to describe their new G.I. Joe toy. Levine preferred the name action figure instead of doll because it was more inviting to young boys. In concept, the original Joe was similar to Mattel's Barbie doll, which had been introduced five years earlier. However, the action figure had better articulation, a feature that made it more appealing because the soldier could be bent into a variety of poses. Furthermore, Joe came equipped with numerous accessories and outfits based on real-life military equipment. G.I. Joe was a huge success and additional characters were added to the line. The franchise has remained a strong seller for almost 40 years. G.I. Joe was followed in 1966 by Captain Action, which was noteworthy because it was a single figure that could be played with as multiple characters. The figure was sold with costumes and accessories from many famous characters including the Phantom, Captain America, Batman, Superman, and Spiderman. Captain Action was the first figure to combine superhero characters with action figures, a trend that continues today. In 1977, Twentieth Century Fox gave a toy license to the Kenner company to manufacture action figures based on its new movie Star Wars. The success of the movie greatly expanded the toy market and ensured the popularity of licensed action figures. Before Star Wars, action figures were typically 8-12 in (20-30 cm) tall, but Kenner designed their figures to be only 3.75 in (9.5 cm) in height. Other manufacturers quickly adopted the smaller figure style. A host of other movie and TV show-based toys soon followed, including Star Trek, Battle Star Galactica, and Buck Rogers in the Twentyfifth Century. In 1983, federal regulations prohibiting the creation of children's programming based on toys were lifted. This opened a new era in action figures. The Mattel Company took advantage of this opportunity and created a cartoon series based on their 1981 action figure line called "He-Man and the Masters of the Universe." These toys were extremely successful and sold over 55 million units that year. These figures continued to sell through 1990, generating a total of over $1 billion in revenue. Several other toys that were made into cartoons achieved similar success and, thus, began a long standing practice of linking toys and cartoons. With the 1984 introduction of the "Transformers" series, action figures reached a new level of this sophistication. Transformers were robots able to transform themselves into other objects, such as fighter jets, tanks, or racecars. Since 1984, the Transformers series has debuted several different generations of toys that continue to be popular. Once conceived, a prototype of the proposed action figure is created with wire and clay—an armature. The head and facial features of the action figure are created separately and with more detail. book Spawn, the action figure industry advanced yet again. These figures were note-worthy because they were made with a much higher degree of detail than any previous toys. This is credited to having the creator of the comic book directly involved with the design of the toys. McFarlane's influence on the development of action figures based upon his comic book has resulted in the detailed toys of today. Once the character has been selected, the actual design process begins with sketches of the proposed figure. The next step is the creation of a clay prototype. This model is made by bending aluminum wires to form the backbone of the figure, known as an armature. The wire form includes the outline of the arms and legs posed in the general stance that the figure will assume. The sculptor then adds clay to the armature to give the basic weight and shape that is desired. The clay may be baked slightly during the prototyping process to harden it. Then, the sculptor uses various tools, such as a wire loop, to carve the clay and shape details on the figure. After creating the basic form, the sculptor may choose to remove the arms and work on them separately for later attachment. This gives the sculptor more control and allows him to produce finer details on the proto-type. Working with blunt tools, the sculptor shapes the body with as much detail as is desired. During this process, photo and sketch references are used to ensure the figure is as realistic as possible. Some sculptors may even use human models to guide their design work. After the general body shape is complete, the sculptor adds the finer details, paying close attention to the eyes, nose, and mouth that give the figure its life-like expression. The designer may attach a rough lump of clay on the main figure as a temporary head while the real head is sculpted on a separate armature. This allows the sculptor to finish the figure's facial expressions independently of the body. At this point, the finished head can be attached to the main armature and joined to the body with additional clay. Once the head is attached, the neck and hair are sculpted to properly fit to the figure. Then, depending on the design of the figure, the costume may be sculpted directly onto the body. However, if a cloth costume or uniform will be added later, the prototype is sculpted without any costume details. During this process, parts of the clay may be covered with aluminum foil to keep it from prematurely drying out. Once everything is completed, the entire figure is baked to harden the clay. Aluminum wire, modeling clay, and various sculpting tools are used to create the prototype. The actual figure is molded from a plastic resin, such as acrylonitrile butadiene styrene (ABS). This is a harder plastic used to form the main body. Softer plastics, like polypropylene and polyethylene, are commonly used to mold smaller accessory and costume pieces. Various fabrics, such as rayon and nylon, may be used for costume components including body suits, capes, and face masks. As a final decoration, acrylic paints of various colors may be used to decorate the figure. In addition, more elaborate toys may contain miniature electronic components that provide light and sound effects. 1 A master mold, or series of molds, are made from the finished clay prototype. These molds are used for mass producing the finished parts for the figure. 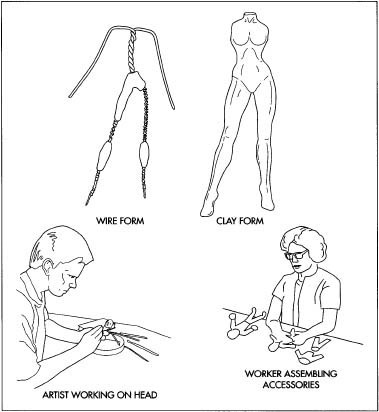 Approximately two-thirds of the time required to make an action figure is involved in creation and operation of the molds. Patterns based on the prototype are made for each individual piece and sent out for assembly line production. This stage may take several months because the manufacturing plants are typically located overseas, such as Asia. 2 The designers must figure out how to best tum the three dimensional figure into a series of plastic parts. Some figures are simply molded from a single piece of plastic and contain a wire skeleton, allowing limited movement. For figures with greater articulation, each moveable part is molded as a separate component. For example, the Star Wars Storm Trooper toys are designed with a hollow chest and solid vinyl limbs. The entire figure is built with swivel joints that allow the limbs to move. Instead of a wire frame, this type of figure contains small gears and washers in the joints of the arms and legs that allow the figure to be bent to any angle and to hold that pose. 3 Several molding processes can be used to create the plastic parts components. For example, Hasbro originally considered a rotational molding process to give its Star Wars figures a smooth, seamless look. However, the size of the pieces caused them to lose some detail and this process was unacceptable. Another problem with rotational molding is that it is a slower process and therefore more expensive for the manufacturer. Instead, Hasbro elected to use an injection molding process. In this process, molten plastic is pumped into a two-piece mold. Pressure is then applied to hold the mold together while the plastic cools and hardens. The mold is then opened and the plastic component is ejected. Each piece of the figure is made in this fashion. 4 After all the individual plastic components have been molded, they are assembled to form the finished figures. Instead of glue, some pieces may be bonded together by an ultrasonic sealing method that uses high frequency vibrations to fuse the plastic together. This process provides a tighter seal between pieces and gives a very thin, almost invisible seam. Hasbro uses this process to create figures with a high level of detail without sacrificing manufacturing speed. Glue is used to attach some auxiliary pieces such as chest plates and boots. 5 A figure may be molded entirely from plastic or the figure's clothing may be made of fabric and attached to the body in a separate process. Hasbro makes action figures' costumes from real fabric, just like in the movies. In their Star Wars series, Admiral Ack Bar has a vinyl belt insignia, while the character Boba Fett has a canvas-like cape. These pieces are prepared separately from the main figure and added after the figure is complete. 6 While the figure itself is being created, the packaging is being designed as well. The package typically consists of a box with a clear plastic window or a cardboard backing covered with a plastic blister shall. Well-designed packaging graphics can increase the value of the figure and, in fact, some collectors never open figures that they purchase so the artwork stays in mint condition. After the package design is completed, it is mass-produced and sent to the production facility where the figures are made. The figures are inserted in the package, which is then glued or taped shut. The finished units are packed in shipping cases and sent to the United States, usually by boat. From there the toys are distributed to various retailers. The quality of toy action figures is controlled throughout the manufacturing process. As the molds are created and tested at the production sites, samples are sent back to the manufacturer for approval. Then a series of stringent safety and quality tests must be conducted to ensure the figures are safe for small children and that they will not fall apart during play. A month or two is required to test each figure's articulation many times and to stress test the packaging. Transit tests are used where they actually ship a toy in its box. Additional tests involve dropping the package on the floor and bouncing it around to replicate rough handling it may receive before it arrives on the store shelf. Action figures are continually evolving depending upon the latest trends in movies and books. Children's programming remains a major source of inspiration, including popular teen shows such as Buffy the Vampire Slayer. A couple of new trends have emerged in the late 1990s. One is a movement toward very realistic, voluptuous female action figures based on comic book characters. Another is the area of sports figures particularly those based on the World Wrestling Federation (WWF). Other advancements in action figures are coming from new computer technology. Modern action figures can have sound chips and batteries that allow them to play taped sound effects at the press of a button. Similarly this technology can be used to give the figure flashing weapons or eyes that light up. As computer technology advances, action figures will become increasingly inter-active and may even be capable of additional functions controlled remotely from a desk top computer. Brady, Mathew. "Toy Making." Toyfare (December 1997). Palmer, Tom, Jr. "Rallying the Troups." Toyfare (October 1997). Rot, Tom. "Rack 'em Up." Toyfare (March 1999). One frequently overlooked part of this history is that when Star Wars was first released it took the toy industry completely by surprise. Demand was so great that for Christmas 1977 Kenner was forced to sell empty bubble packs that could be traded in for actual figures as these became available early in 1978. Nearly every one of these was remitted by April of that year and the empty packs destroyed. Of course since the concept of 'collectibles' had not yet evolved this made those rare unexchanged packs one of the most valuable Star Wars items of all time. So for action figures and things that require this level of detail, CAD is not used during the modeling process? What about 3D printing?